In this article, we will learn about Squirrel cage and slip ring induction motors. These motors are having the difference in rotor construction. In Squirrel cage induction motors the rotor is simplest and most rugged in construction. Cylindrical laminated core rotor with heavy bars of copper or Aluminum is used for conductors. Rotor conductors or rotor bars are short-circuited with end rings. Rotor bars are permanently short-circuited and hence it is not possible to connect an external resistance in the circuit in series with the rotor conductors. There are no moving contacts in the rotor. Low starting torque. It has 1.5-time full load torque. What are the advantages of skewing of rotor conductors in Squirrel cage induction motor? There is a production of uniform torque. Due to this noise during operation reduces. The magnetic locking tendency of the rotor reduces. During locking process, the stator and rotor teeth attract each other due to magnetic action. This locking process is called as Cogging. To avoid magnetic locking due to cogging, thats why conductors are skewed. Note: Number of Poles and phases develop automatically in cage rotor and equal to number of Poles and phases as in stator. This means that rotor responds automatically for the change in stator poles. In slip ring induction motors the rotor is wound type. In the motor the slip rings, brushes are provided. 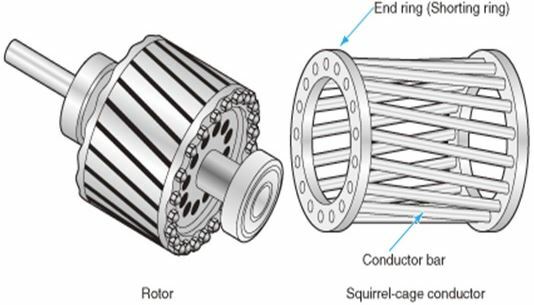 Compared to squirrel cage rotor the rotor construction is not simple. Cylindrical laminated core rotor is wound like winding on the stator. At starting the 3 phase windings are connected to a star connected rheostat and during running condition, the windings are short-circuited at the slip rings. It is possible to insert additional resistance in the rotor circuit. Therefore it is possible to increase the torque; the additional series resistance is used for starting purposes. Carbon brushes, slip rings, etc. are provided in the rotor circuit. It has comparatively less efficiency. The purpose of using phase resistance in rotor circuit is to decrease the supply starting current and increase the starting torque. Secondly, it is used for controlling the speed of the motor. Rotor winding must be star connected. Like a stator, rotor windings must be distributed and short pitched. The rotor must be provide with same number of stator poles. It cannot respond automatically for the change in stator pole. The absence of brushes reduces the risk of sparking. It has good running performance. External resistance can be connected to the rotor circuit to control the motor speed. Rotor impedance at the time of starting is less. So starting current is high. Hence, it needs extra starting equipment. It has poor starting performance. There is wear and tear. Note: In Slip ring Induction Motor, Stator is wound for 3 phase winding. But rotor can be wound with any number of phases except single phase. But in actual practice, in order to get symmetry placement of windings. Hence to get good mechanical balance, the rotor is also placed with 3 phase winding. Q: State the types of Induction motor? 2) Wound or slip ring Induction motor. Q: Why skewing is done in squirrel cage Induction motor? Q:What is the purpose of connecting external resistors to slip ring Induction motor? Answer. It increases starting torque and decreases starting current. Q. Can we add extra resistance in series with squirrel cage rotor? State the reason? Answer. We cannot add extra resistance in series with the rotor because all the copper bars of the rotor are short circuited in both the sides by copper end rings to have a closed circuit. Q: Why wound rotor construction is adopted? Answer. The wound rotor has the facility of increasing the rotor resistance through slip rings. High value of rotor resistance is needed during starting to get a high value of starting torque. Q:What are the advantages of slip ring motor over squirrel cage motor? 1. The starting torque can be varied by adding resistance to rotor. 2. The speed of the machine can be varied by injecting an emf through slip rings to the rotor. Answer. The slip rings are made of copper alloys and are fixed around the shaft insulating it. Through these slip rings and brushes the rotor winding can be connected to external circuits. Q: What are the materials used to manufacture the brushes for slip rings of an induction motor? Answer. The slip rings are made of brass and phosphor bronze. The brushes are made of metal graphite which is an alloy of copper and carbon. Q:Name the materials used to insulate the laminations of the core of induction motor. Answer. The materials used to insulate the laminations are kaolin and varnish. Thank you sir/mam. Please also mention disadvantages. Article is updated with disadvantages. Hello, would it be possibe to get the source of the Fig.1? Is it from some textbook?